On November 18th, Leonard Bellavia and John Gentile held a seminar for NYSADA members in the Albany area. The seminar addressed: Factory Demands for Facility Upgrades and the Dealers Best Strategys, GMs EBE Program  How to Deal with Objections, and Warranty Parts Reimbursement. The dealer members present peppered the attorneys with a mix of specific scenarios affecting their dealerships. Several of the dealer attendees commented that this seminar was extremely informative and left them in a better position to respond to factory pressures. A regularly quoted source of comment for Automotive News, Mr. Bellavia is also a regular speaker for national automotive and marine related trade organizations. He serves as Chair of the Automotive Franchise Law Section of the Franchise Law Committee of the New York State Bar Association and has been named Chairperson of the Litigation Section of the National Association of Dealer Counsel (“NADC”) and a member of its Board of Directors. 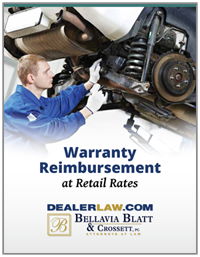 Since joining with Leonard Bellavia in 1991, Mr. Gentile has personally handled hundreds of buy/sell transactions over his years in practice and is considered an expert in automotive warranty parts reimbursement.